Rural infrastructure is not only a key component of rural development but also an important factor in ensuring any sustainable poverty reduction programme. The proper development of infrastructure in rural areas improves rural economy and the quality of life promoting better productivity, increased agricultural incomes, adequate employment, etc. Kalburgi Plant has adopted 5 villages for social development. Chatrasala, Kherchkhed, Burugpalli, Garagpalli and Irugpalli. The villages lacked basic infrastructure with puddled slushy streets and mosquitoes breeding resulting in unhealthy living conditions. 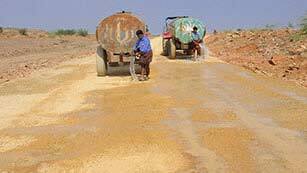 6000 meters of laid concrete roads significantly improved the living conditions impacting the lives of 7,000 villagers. 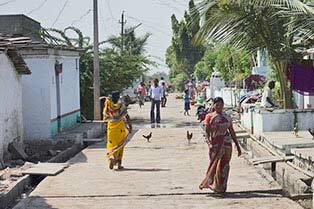 Kadapa Plant has adopted 8 villages that were considered for holistic development. Nallalingayapalli, Pandillapalli, J. Kothapalli, Agasthalingayapalli, T. Sunkesula, Thippaluru, Gollapalli and Thurakapalli. The villagers have emphasized for better road as these villages lack good roads resulting in insufficient transportation and connectivity to other places. Children faced problem reaching schools, especially in monsoons due to water clogged roads. We have built a 3 kilometers road in Nallalingayapalli, Thurakapalli, Pandillapalli and T. Sunkesula impacting 6,400 villagers. We have also laid 2.5 kilometers of gravel road connecting Nallalingayapalli with Thurakapalli village.